Throughout 2017, Railroad Workers United has begun the process of reaching out to rail advocacy organizations in an attempt to build an alliance between railroad workers and railroad advocates. By late summer, RWU officially joined the group Rail Users Network (RUN). This organization is a loose association of various local and regional groups who advocate for new and expanded passenger train service in various parts of the country, mostly on the east coast but other locales as well. RUN officially opposes single employee train crews. In October, RWU formally affiliated with the National Association of Railroad Passengers (NARP). This organization just celebrated its 50th anniversary at a conference in Chicago November 2 - 5th, 2017. RWU was represented at the conference by two members and was joined by others to staff the RWU information table. We were able to reach many overs and shakers in NARP and were well received by the 300 delegates in attendance. All RWU members are encouraged to join either or both of these organizations and express our solidarity and support for their efforts. 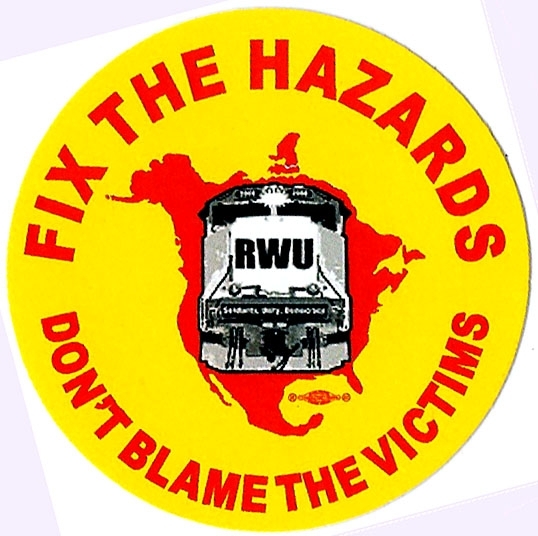 To explain the campaign to further an alliance between RWU and the other sectors of the working class, rail advocacy groups, passengers, environmentalists, community activists, and others, RWU has produced a new leaflet that we hope to distribute broadly. It is written for both railroad workers and our allies to better understand the necessity for such an alliance, and to gain a better understanding of how to build it. Download a copy today! Or if you would like to order multiple copies, we will mail them to you. Click HERE to be taken to the RWU where you can place your order. In recent years, public attention has focused on the railroad. In the wake of Lac-Mégantic and other derailments, the public is alarmed about oil trains and the movement of trains in general through their communities. Environmental activists, other community organizations and community and state governments are up-in-arms about the amount of fossil fuels moving by rail. Farmers and other shippers are concerned about the congestion that crude-by-rail caused in 2014-2015. .
As all railroaders well know, the public generally has no idea what goes on daily on America’s railroads. 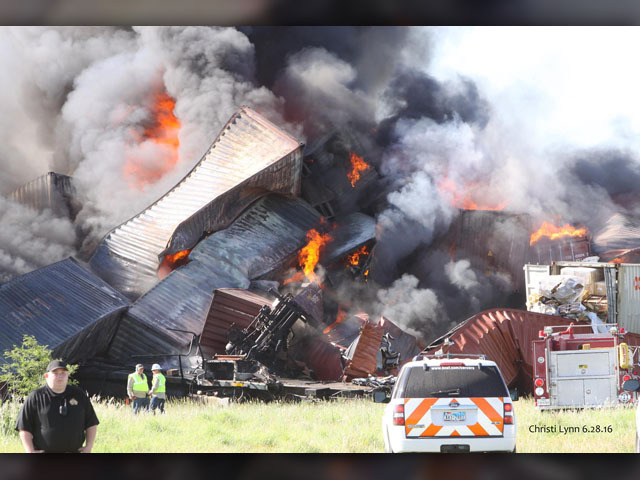 Chronic crew fatigue, single employee train crews, excessively long and heavy trains, draconian availability policies, short staffing, limited time off work create challenging safety issues of concern not just to railroaders, but to the entire population. As railroaders, we know that crude-by-rail creates jobs and we know that rail is the safest way to transport most any commodity. But we also know the rail industry has taken advantage of a lax regulatory environment, conservative pro-business governments, and weakened unions across North America to roll the dice on safety. If all of rail labor is ever to be successful in the fight to achieve a safe working environment, we must be able to educate the public about our situation and the dangers that we - and by extension, they - face.. We must find common ground to bring railroad workers, environmentalists, community activists and concerned citizens together in order to build the movement for a safer and greener railroad, one that is more responsive to the needs of workers, track-side communities, citizens in general, and society as a whole. CLICK HERE to find out more about RWU's first successful efforts to reach out & find common ground with environmental & community organizations. Donald Trump and his congressional Republican allies have taken control of the U.S. government. The result threatens to be devastating for both labor and the climate — not to mention immigrants, African Americans, Muslims, women, children, the elderly, the disabled, LGBTQ people, and many others. In the face of aggressive attacks, a wide range of national organizations have come together to create A Grand Alliance to Save Our Public Postal Service. These organizations are united in the demand that the public good must not be sacrificed for the sake of private investment and profit. A strong public Postal Service is our democratic right. The Alliance - which includes Railroad Workers United - is fighting to protect and enhance vibrant public postal services now and for many generations to come. Get the facts HERE. In the past few years, labor & community organizations have found that they are stronger when they find common ground & unite around issues important to each. Below are just a few examples. New York City transit workers are allying with bus and subway riders for better conditions. But the local officers, headed by President John Samuelsen, had run on a promise to form coalitions with the riding public. We knew that to restore lost service, we’d have to involve the communities hit by the cuts. When we did, we discovered an untapped resource of connections our stewards had—outside the workplace. Read more. "...Last fall, a broad group came together to tackle these problems. Called Organized and United for Respect at Vanderbilt, OUR Vanderbilt’s mission is to institutionalize community support for a worker-led movement for economic justice. They’re asking for better wages, to reflect workers’ importance to the university." Read about it HERE. "After years of organizing, Los Angeles car wash workers successfully negotiated contracts with three car washes and gained workplace rights most workers should be able to take for granted: sick leave, access to health care, workplace safety, lunch breaks, living wages and respect. The car wash workers were successful, in large part, through the strength of community-labor partnerships: the United Steelworkers teamed up with the Community Labor Environmental Action Network (CLEAN), faith-based groups such as Clergy and Laity United for Economic Justice and low-income immigrant rights organizations such as the Wage Justice Center and Koreatown Immigrant Workers Alliance." Members of the Seattle community join with railroad workers to protest the prospects of single employee train crews on September, 2014. RWU sees huge potential to build a labor - community alliance around rail safety issues of concern to both workers and community members.